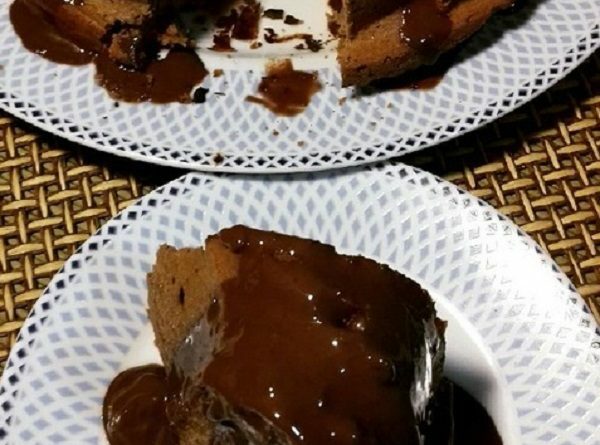 Perfect for parties, family gatherings, holidays, and more this keto chocolate and gluten-free bundt cake is super easy to make. This cake will for sure please a crowd. In one bowl whisk together almond flour, coconut flour, erythritol, baking soda, and salt. In a small pot, heat together butter, and cocoa powder over medium heat. Whisk continuously unless combined and then take it off the heat. Pour in half your cocoa mixture into your dry ingredients and stir to combine. Once it’s become thick and difficult to stir, pour in the other half and combine. Add in 1 egg at a time to your bundt cake batter. Add sour cream and vanilla extract and stir. Pour the batter into a greased bundt cake pan OR into silicone bundt cake pan and bake for about 40-50 minutes. The time of baking depends on the oven. When the cake is done allow to cool completely before inverting onto a cake stand. Meanwhile, while the cake is cooling, prepare cocoa frosting. To make the frosting, melt together the coconut oil and cacao powder, add stevia to taste 2-3 drops at a time. Pour the frosting over the cake and serve.